A small group of travellers and a professional local leader (who’ll become your local friend) to guide you through his land are the perfect way to discover the Wonders of Northern Italy of North Italy. Explore Venice, Florence and Rome like a local. Your local leader will take you on “Like a Local” walks where you’ll see the unmatched beauty and mystery of these cities from an authentic (local) point of view. You’ll enjoy a magical boat trip in the Gulf of Poets, dive into the clear water where Lord Byron once swam and admire a terrific sunset while enjoying traditional Italian refreshments. You’ll explore the picturesque villages of Cinque Terre, walk through an olive grove and see the most breath-taking views. You’ll admire the famous Leaning Tower of Pisa and the marble wonders of Piazza dei Miracoli. You’ll spend a day in the Tuscan countryside of Chianti, meet a local wine producer and taste his wine and other delicious products from local farmers. Train is one of the best and fastest means of transport in Italy (up to 300 km per hour!). Travelling by train gets you to where you’re going quickly, but allows you to relax, have fun, and socialize while you take in the beauty of the Italian landscape. On this tour we’ll do lots of our travelling by train. Upon arrival in a new destination on this tour, a taxi will take you to the next hotel (except in Venice and Cinque Terre where it is faster to walk). At LocalWonders Travel we pride ourselves on providing tours that allow our guests to explore cities by foot. Why? Because we believe that exploring by foot is the best way to get an authentic Italian experience. Sometimes we explore for up to three or four hours at a time. We do this at a relaxed and comfortable pace, stopping to rest once-in-a-while to enjoy an espresso or gelato, and promise that you’ll have a wonderful time, but guests should note that walking is a big part of our trips! There are 3 means of transport to get to the city from the Marco Polo airport in Venice: public means, taxi or private transfer with a driver. Bear in mind that Venice is entirely built on water and vehicles do not go beyond Piazzale Roma (around the Venice train station), hence you cannot be dropped at the doorstep of your hotel. Given that many hotels don’t have access from the canal, water taxis can also drop you off close to the hotel but not always at the doorstep of the hotel. 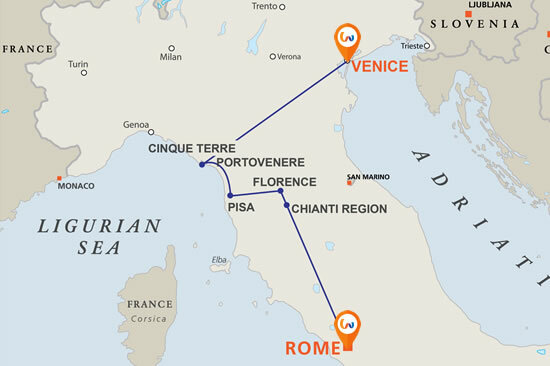 Below is a brief illustration of the various ways to reach Venice from the Marco Polo airport. However, we particularly recommend taking a shuttle bus or the Alilaguna boat (a small boat connecting the airport to the city). Ca’ Pozzo Inn is a 7-minute walk from the shuttle bus station and 3-minutes walk from the Alilaguna boat station. It is pretty easy to reach the hotel by foot without chances of getting lost. Within 3 weeks of your departure, we will send you detailed instructions on how to reach the hotel. Public means – By roadOutside the airport there is a shuttle service connecting the airport with the city. The shuttle will drop you off in Piazzale Roma. The shuttle is bus n° 35 of the ATVO Company. It takes 20 minutes to get to Venice city and charges €8 . For further details, please check the he ATVO webpage. From the Venice airport you can take a small boat called Alilaguna arancione. The boat charges €15 (including 1 bulky luggage and one hand luggage). It takes about 45 minutes to get to the city. You may buy a ticket at the airport or on-line. For further information or to buy a ticket on-line, please check the Alilaguna webpage. If you buy a ticket on-line, please remember to print the voucher and replace it with a ticket at the special ticket desks at the airport of Venice. You will find a help desk of some water taxi companies at the arrivals hall. Water taxis have a fixed charge ranging between €100 and €130 for 1 to 4 passengers (depending on the hotel location). Every person has the right to board with a bulky luggage. Every additional passenger or luggage are charged €10 extra. Make sure you have clearly agreed on luggage and final charges at the help desk before buying the ticket. Considering how Venice is built, bear in mind that water taxis often cannot drop you off at the hotel doorstep, but they can drop you nearby (about a hundred metres away). Considering how Venice is built, bear in mind that vehicles and water taxis often cannot drop you off at the doorstep of your hotel. Vehicles will drop you off at the shuttle bus station while water taxis can drop you off closer to the hotel. Rome has two airports, Roma Fiumicino (main) and Roma Ciampino (secondary). Here is how to get to the two airports. Train Leonardo Express from Roma Termini railways station. Approximately 30-minute trip, price €14. For more information check the Trenitalia website. Bus from Roma Termini railway station (via Marsala). Approximately 1-hour trip, price €8. For more information see Aeroporti di Roma website. Approximately 1-hour trip. Price approx. €45-50 set price. Bus from Roma Termini railway station (via Marsala). Approximately 45-minute trip, price €4-6. For further information see Aeroporti di Roma website. On this tour we travel aboard comfortable high-speed trains and sometimes regional trains. Besides being fun, trains are an ecological means of transport and they are often the fastest and most comfortable means to get to destination. Other means of transport used during this trip also include buses, subways, boats and taxis. Should you wish to add a museum visit your local leader will be happy to provide guidance in making those arrangements. In Florence we recommend booking ahead of time during high season (June and September). Visits to the museums in Florence should be booked for Day 6 of the tour so as not to coincide with other scheduled tour activities. If you are unsure about when best to book your museum visit, contact LocalWonders Travel. To reserve see the Polo Museale Fiorentino official website. Should you wish to visit both museums the same day we recommend you book one museum in the morning and the other in the afternoon. The Uffizi Gallery and Galleria dell’Accademia are about 30-minute walk away from each other. Note: Visits to the museums in Rome should be booked for Day 9 (or later) of the tour so as not to coincide with other scheduled tour activities. If you are unsure about when best to book your museum visit, contact LocalWonders Travel. Benvenuto in Italia! Starting from Venice is like jumping into a dream where little alleyways and canals form a fascinating maze in the lagoon and the elegance of centuries-old palaces is mirrored in the water. In Venice the aroma of good food and wine, together with the sound of laughter from the bacari (local inns), create a multisensory experience you’ll never forget. Your tour starts at 6:00pm with a Welcome Meeting where you’ll meet your local leader and fellow travellers. (Upon arrival at the hotel you’ll find a note telling you where this welcome meeting will take place.) Following the meeting, you’ll discover one of Italy’s most famous wonders – the food! The group will enjoy a special welcome dinner at a local restaurant where you will dine like the Venetians do. After a good breakfast and a real Italian coffee, we’ll set out to explore Venice. And you’ll find the city alive! The Rialto market is full of colors and flavours and the canals fill up with gondolas and life. Today your local leader will take you for a “Like a Local” walk where you’ll mingle with locals, hear curious stories and see the authentic side of this fascinating city built on the water. We’ll cross the Canal Grande like the Venetians do, walk along calli (alleys) and campielli (small squares) and after taking a few hidden twists and turns we’ll arrive in San Mark Square. During the afternoon you’ll enjoy some free-time, where you can choose to relax or keep on exploring Venice, taking a gondola ride for example or visiting the islands of Murano and Burano. Or perhaps you’ll choose to eat and drink! You cannot say you truly know Venice if you haven’t had an ombra (local wine) and tasted some cicchetti (small bites) in a typical bacaro (a small inn where Venetians meet to catch up, laugh, and pass the time). Your local leader will give you plenty of suggestions for organizing your afternoon. Both the afternoon and evening are “free time”. In the evening, you might like to join your local leader as he visits some of the best local bacari (inns) in the city. And by “some” we mean more than one! It’s possible to check out several bacari in an evening, enjoying great drinks and delicious small bites in each. This is a very fun way to spend an evening in Venice. After checking-in at our hotel, we will explore Portovenere and the Gulf of Poets. There, Captain Mario will welcome us aboard his boat, offer us a welcome drink, and then show us the wonders of this gulf and the secrets of Palmaria Island. The best part? We’ll visit a bay that’s only accessible by boat to swim in the crystalline waters where Lord Byron used to splash! Back on the boat, we’ll enjoy some refreshments (including delicious local products like anchovies, pesto and focaccia) and an aperitif as we toast the sunset together. In the event that bad weather forces the cancellation of our boat tour, this activity will be replaced with an equally-fun indoor activity of the same value. Further, depending on seasonality and on our group size, the boat tour may be shared with another small group (like ours). Finally, depending on conditions, the boat size and style may change. That said comfort and safety are always key so we promise that you’ll have a great time! Today you will explore an incredible wonder: five fishing villages suspended between sea and mountain, surrounded by vertical vineyards, olives trees and colorful houses built one on the top of the other. The Cinque Terre region was named a Unesco World Heritage site for its beauty. It’s also only accessible by foot or by train! So wear comfortable shoes and join your local leader for an amazing walk along the stunning paths that link these historic villages, where nature and man worked together to create a scene of unmatched beauty. At the end of the walk, we’ll leave our shoes on a rock and don our swimsuits for a refreshing swim in the aquamarine sea of the Cinque Terre. If you don’t feel comfortable walking, don’t worry: the railway links each of these villages and in less than 5-minutes you can go from one village to the next. There are several trains per hour and with the help of your local leader it will be easy and fun exploring Cinque Terre by the train. – Cinque Terre Pass – This is a ticket that allows you to hop on and off the train for the entire day, as well as free access to the Cinque Terre paths. – Vernazza – Monterosso: a 2.5-hour walk with some steep sections; moderate difficulty (this is the most challenging part of the trek, but it is also the one with the most spectacular view). Elegant, iconic and curiously leaning, the Tower of Pisa has attracted travellers and architecture lovers from all around the world. This morning, on our way to Florence, we will stop in Pisa to admire the Leaning Tower and the marble wonders of Piazza dei Miracoli. We will then continue on to Florence where, after checking-in to our centrally-located hotel, we will take an exciting “Like a Local” walk around this magical city. We will see how the beauty of the Renaissance and the art of great artists like Michelangelo melt together with elegant shops and one of the richest Italian culinary traditions. You’ll learn about the curious street number system of Florence, discover a secret corridor suspended between the street and the sky, walk in an open-air museum and eat in a lively street market that offers gourmet food until late night. While we will visit the Leaning Tower of Pisa, entry/climb is not included in the tour (tickets are €18). Today, Florence is yours! You will enjoy a free day at your own pace to explore the parts of Florence that intrigue you the most. Your local leader will give you plenty of suggestions to help you organize your free time. You can relax, strolling elegant alleyways, explore the Oltrarno neighborhood, or go shopping among the famous leather markets and boutiques. If you like art, you won’t want to miss the Uffizi Gallery. It’s one of the most important museums in the world and holds masterpieces by Giotto, Botticelli, Leonardo and Michelangelo. If you’ve got a passion for sculpture, we suggest exploring the Galleria dell’Accademia to see the majestic David of Michelangelo and visit the Bargello museum. Be breathless in front of the overwhelming beauty of the Santa Maria del Fiore marble façade, walk the 400 steps of the Giotto bell tower or reach the top of the Brunelleschi dome. If you are a food lover, Florence is a treasure chest to open: old artisan gelato shops, small venues serving high-quality wine, pecorino cheese, finocchiona salami and the savoury Tuscan ham. Visit in local inns to indulge in real pappa al pomodoro (a typical soup made with basil, tomato, garlic and extra-virgin olive oil) or the fiorentina, the typical 1kg Florentine steak. If you want to visit the Uffizi Gallery or the Galleria dell’Accademia (David of Michelangelo), it is very important to reserve in advance in order to avoid long queues. Ask your local leader on Day 1 to assist you in making these reservations or read the section “Booking Museum Visits” in the Trip Notes of this tour. After enjoying a delicious breakfast with treats from local producers, we will hop on a local bus to go to the heart of the Tuscany countryside: the Chianti region. Here, the hills and the vineyards form an impressive landscape where their colors blend with their shapes in beautiful harmony. Today a local wine producer will welcome us into his home to tell us the story of his family and to show us the winery where he produces his exquisite Chianti. The best part? We’ll taste the wine, some of the best in Tuscany, in one of the most incredible landscapes in the world. We will go back to Florence in the late afternoon to enjoy the magical atmosphere of this city for another night. The rest of the day is at your leisure (free time). Once more we will travel at 300 km/h aboard a high-speed train connecting Florence to Rome in just an hour and a half. Rome, the heart of the ancient Roman Empire, is the cradle of a rich history and the birthplace of the Italian dolce vita. Admire the wonderful baroque palaces and squares designed by Bernini and Borromini, see the magnificent works of Michelangelo and enjoy the vibrant and lively dolce vita of Rome. After checking-in at our centrally-located hotel, we will start a “Like a Local” walk where we will stand at the top of the Spanish Steps, see an elegant 250-year-old café, admire the elegance of the Trevi Fountain and the majestic Colosseum. During your walk you will also discover a lot of other secret wonders of Rome, from small artisanal gelato shops serving fresh and original flavours (like lime and chili! ), to fascinating squares that hosted chariots races thousands of years ago. Following our walk, you’ll enjoy an afternoon and evening at your leisure (free time). Today you’ll enjoy a free day for exploring the wonderful city of Rome at your own pace. Your local leader will provide plenty of suggestions for organizing your free time. You might choose to visit the Vatican Museum and Sistine Chapel, or the Borghese Gallery, the ruins of ancient Rome or visit the Colosseum. Lose yourself in the fascinating Roman neighbourhood of Monti, Trastevere and the Aventino, stop for an aperitif or for taking an artistic picture of a hidden corner. And then head back to your hotel, relax a little and get ready for our Farewell Dinner. We’ll gather at a special local restaurant to enjoy an exquisite Roman meal – like an authentic carbonara or saltimbocca alla romana. If you would like to visit the Vatican Museum, the Sistine Chapel, or the Colosseum, it is very important to reserve in advance in order to avoid long queues. Ask your local leader on Day 1 to assist you in making these reservations or read the section “Booking Museum Visits” in the Trip Notes of this tour. Our tour has come to the end. We hope you’ll have had the time of your life! Enjoy one more Italian coffee with its unforgettable aroma, and then head towards your flight home (or your next destination). Arrivederci! Our tour ends with breakfast. There are no activities planned for today. If you need help in organizing your airport transfer or purchasing train tickets, just ask. Your local leader will be happy to help you in making these arrangements. Note: If possible, plan for and purchase transportation to the airport a few days in advance – organizing same-day travel can be difficult.